This quaint, gated Mediterranean development is a favorite for both year round residents and seasonal buyers or renters. Surrounded by high end developments and backing up to PGA West, it is perfect for golfers, or equestrians who don’t want the huge development feel. Puerta Azul translates to “Blue Door” and blue entry gates and Mediterranean blue touches throughout this community are lovely. There is only one horseshoe shaped street with a couple of cul-de-sacs in this community of “pods” as they are known. Each pod is a small grouping of units. Each home has one enclosed garage space, and also street parking scattered throughout. Beautiful landscape, meandering walking paths and common areas, two large pools, a bocce ball court, a tennis court and a wonderful clubhouse with gym, meeting areas, pool table and kitchen all welcome you to Puerta Azul. 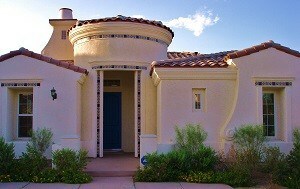 Homes at Puerta Azul are very desirable. Talk about having the least expensive home in a very luxurious neighborhood! Puerta Azul is surrounded by high-end homes and golf developments. These homes are unique in that they are fairly small, 1300 sf to approx. 1750 sf, manageable and very easy to lease out. Very well built, solid feeling homes with lovely upgrades, this development is built out, although construction began in 2004-2006. The homes are considered attached single family residences, though there are a few free-standing units. Recent HOA: $315/month There is also an annual HOA of $165/year. Additional Amenities: Walking paths, a small dog park, community pools (2), clubhouse, fitness, tennis court, bocce ball court. People that like Puerta Azul also tend to enjoy Renaissance in La Quinta, Parc La Quinta and the La Quinta Cove.